An important part of building number sense is learning that numbers can be broken apart (decomposed) and put together (composed). This helps children make friendlier numbers to work with. For example, if a child needs to add 9 + 6 = ?, he could break apart 6 into 5 and 1, add the 1 to the 9 and then have the equation 10 + 5 = ?, which is much easier to solve. 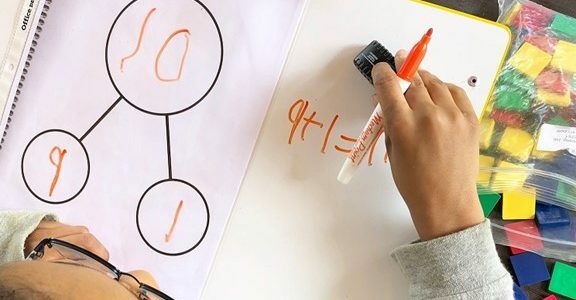 Without this skill of breaking numbers apart and moving them around, a child is likely to resort to counting on his fingers when presented with a problem that he doesn’t “just know” right away. 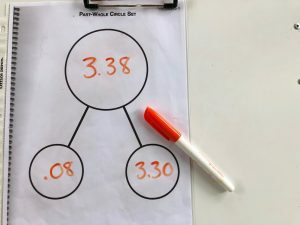 A good tool for a child to visualize this number relationship is a simple part-part-whole circle mat. 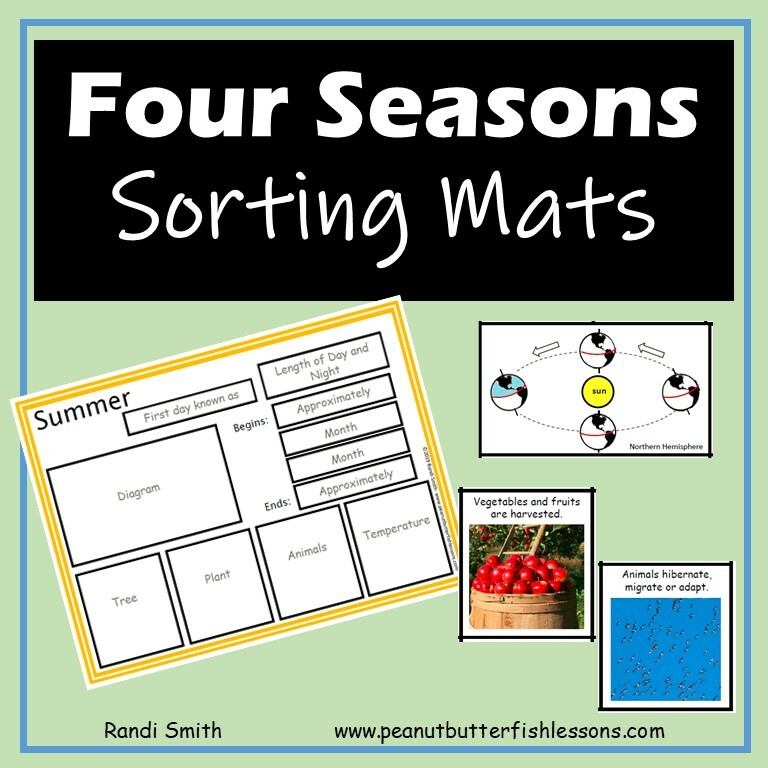 There is a printable part-part-whole circle mat at the bottom of this post and here are some ways to use it. 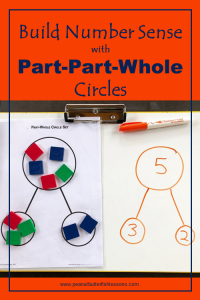 When we first introduce children to the part-part-whole circle mat or any new concept for that matter, it is good to use some type of manipulative so they can see how the amount is literally being broken apart into two groups. 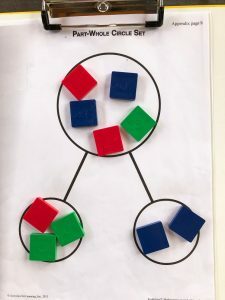 These tiles are a great manipulative for this activity. First, place a number of tiles in the top circle of the mat. 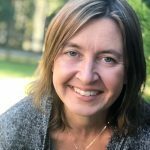 If you are working with young math learners, 5 or 10 would be good numbers to start with. Then give them a pile of the same number of tiles and ask them how they can break the pile into two groups or parts and have them place them in the part circles. Next, ask your child if there is another way they could take those bottom tiles and brea k them into two groups. For example, if your whole number is 10, then your child could have groups of 5 and 5, 4, and 6, 7 and 3, etc. Once your child becomes comfortable with this, have him take the tiles out of each circle and write in the number of tiles to start to see the abstract symbols attached to what she is doing. Then go ahead and write the addition equation down below for them to see how those numbers relate to each other in an equation. Explain how int he equation you write the two parts and then combine them into the whole. 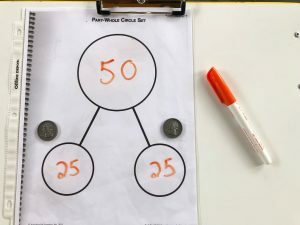 You can vary this activity, by placing tiles or numbers in the part circles and your child has to determine the whole number that they add up to. For example, place 3 and 4 in the part circles and your child fills in the whole circle with 7. 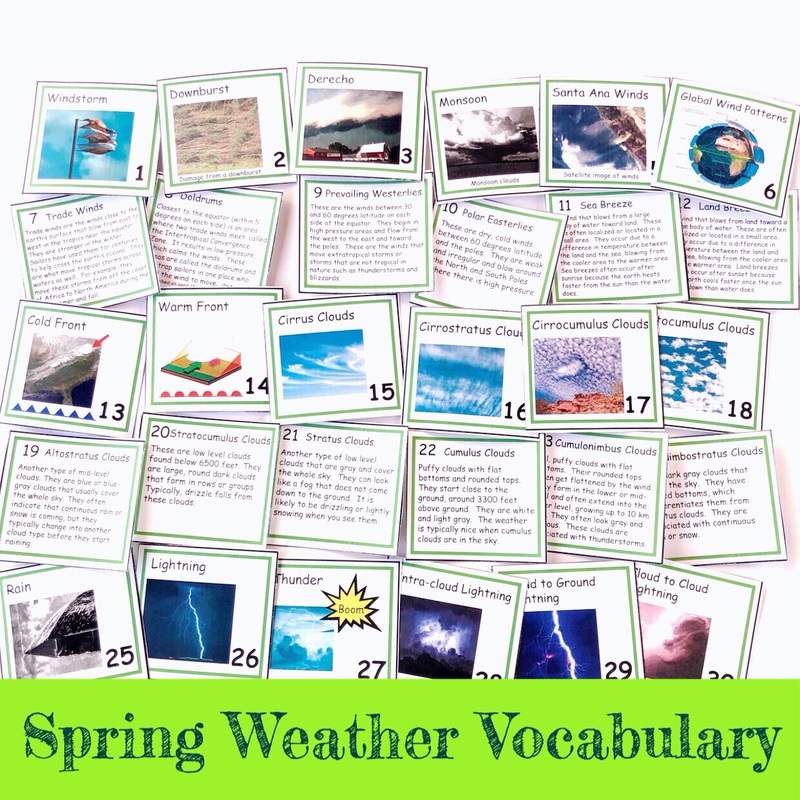 Use tiles or another manipulative when introducing this activity. 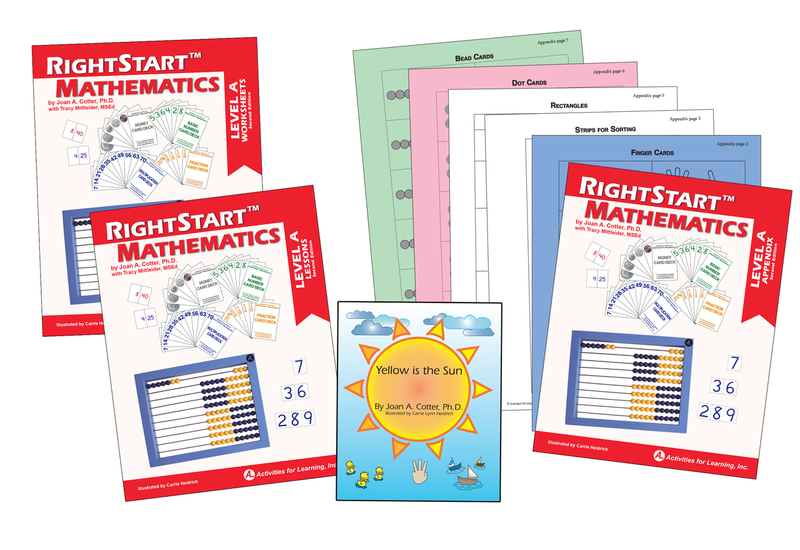 You can continue to use the part-part-whole circles as your child develops his math skills to higher levels. 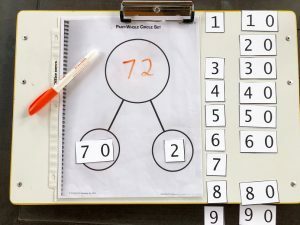 So as your child is introduced to new types of numbers such as multi-digit numbers, fractions, decimals, etc., continue to take out the part-part-whole circles and experiment with ways to break numbers apart. 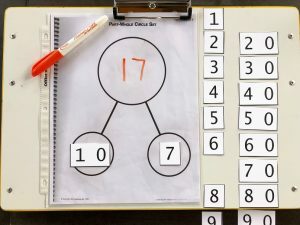 Double-digit addition: If a child comes across the problem 67 + 48 = ?, it would be helpful if it occurred to them to break 67 into 65 and 2 so that he could add the 2 to the 48 and make the problem: 65 + 50 = ?. 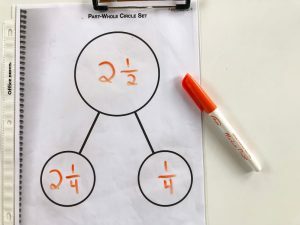 So as your children are working with numbers with multiple digits, encourage them to still practice with the part-part-whole circles. Money: If you are teaching your child about money, the part-part-whole circles are a great activity to show them how to decompose bills and coins into smaller denominations. Fractions: The concept of decomposing and composing numbers helps with fractions, too. You could start with a 1 in the whole circle and talk about different ways to break it up. Drawing a representational picture like the pie below can help children visualize this. It is also important to practice decomposing fractions themselves. Imagine if you have the problem 3 1/2 + 2 3/4 = ? It would be helpful for your child to know to break 3 1/2 into 3 1/4 and 1/4 and add that 1/4 to 2 3/4 to make 3 so the new problem would be 3 1/4 + 3 =?. Decimals: The same goes for decimals. If presented with the problem 23.4 + 32.8 =?, it would be helpful to think about breaking 23.4 into 23.2 and .2 and then adding the .2 to 32.8 to make 33. The new problem would be 23.2 + 33 = ? When you are ready to talk about subtraction, place a number in the whole circle and one in the first part circle. Then ask your child what number would go in the other part circle. 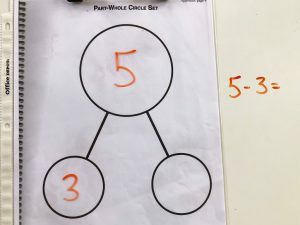 For example, write 10 in the whole circle and 4 in the first part and your child should fill 6 in the other part circle. 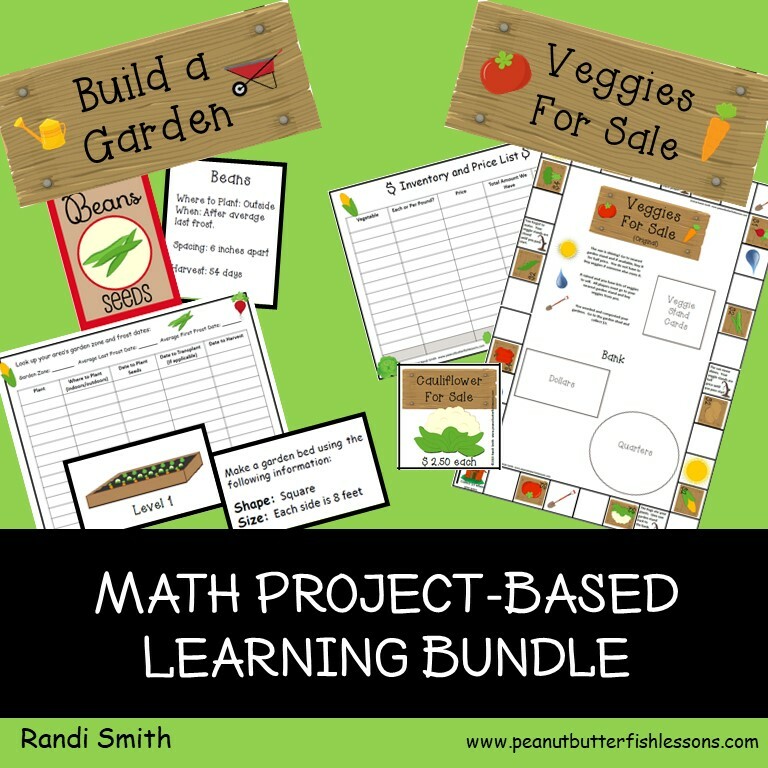 Work with tiles if your child still needs the concrete manipulatives or written numbers if they are at the abstract level. Then write the equation down below. 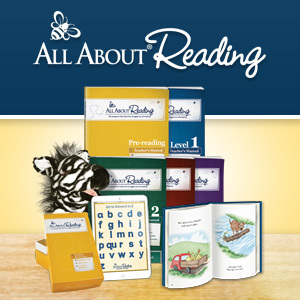 Talk about how in subtraction you start with the ‘whole’ and you are breaking it into parts. 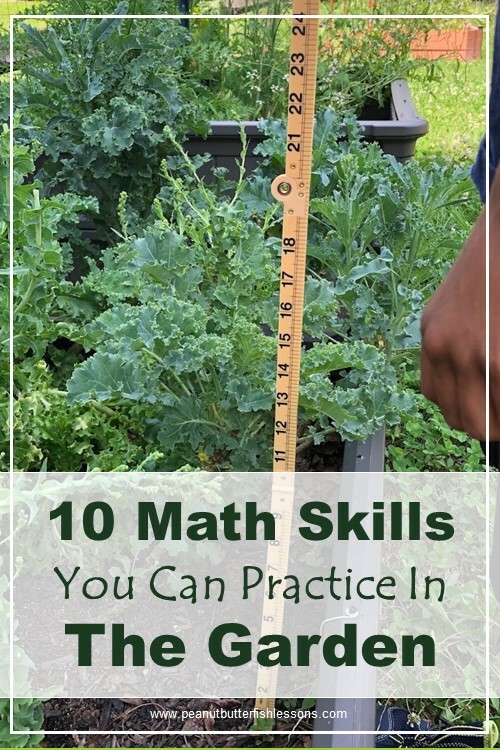 Once your children are comfortable with decomposing and composing numbers, encourage them to do this when solving math problems. You may want to keep the part-part-whole circles nearby so they think to use it as a resource. We have been using this concept a lot to make friendly numbers with my oldest as he has started learning long division. 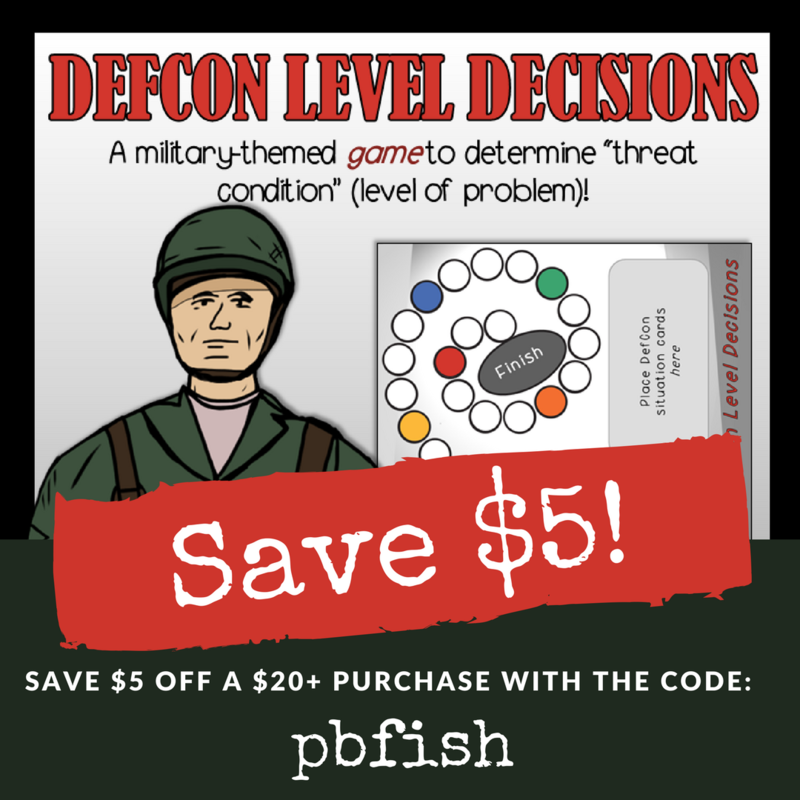 Subscribe to receive the part-part-whole circles and number tiles, as well as, our latest posts and freebies straight to your inbox. 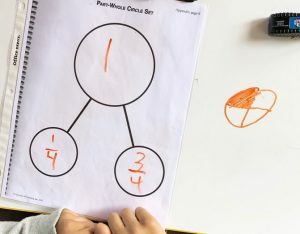 Next ›What Order Should We Teach Addition Facts In?